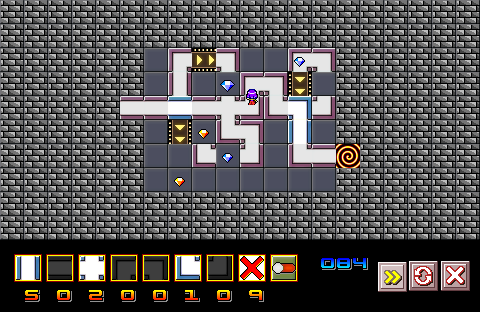 Auto Amy is a mouse controlled puzzle game. Very similar to Mario and Donkey Kong (Puzzle Palace mode), but with slightly different physics. You have to drag a limited amount tiles onto the board to create a path for Amy to follow to the exit, collecting all the jewels on the way. It's pretty simple to pick up. The X tile will destroy a tile you placed, either to correct a mistake or to remove a tile to make a different path once already passed. The switch will change the direction of conveyor belts. This is a very early build, to test the main engine is working, with just four levels for now. The options screen just goes to the level select screen. UPDATE: New levels (13 in total), new mechanics including teleporters, locked block and bonus tile pickup. Also included is a secret level. Any feedback would be appreciated thanks. Edited by EgoTrip, 29 December 2014 - 01:02 PM. The graphics look really charming, I will check this out later. It's not possible to collect all the gems is it? Not on level 3 its not, I noticed I forgot to fix it right after I uploaded it. It will be fixed for the next build. The other 3 levels are all fine. Thanks for the comments. I have updated the original topic with a new build, which now includes 10 levels (level 3 is now fixed) and a few little tweaks here and there, most notably a diamond indicator and a portal on the start square so you know where Amy will start. I also increased the maximum wait time to 30 seconds. To come in forthcoming builds: saving, audio, more levels, maybe more mechanics. I am also going to include some secret/bonus levels which will need to be discovered and unlocked. Ah, honestly, my biggest issue with this was that it wasn't a drag and drop, it was more of a click and click. The puzzles could be a bit harder. Maybe having to get Amy to press buttons or collect a key to unlock a certain tile. It does need spicing up a bit because at the moment it is a little too simplistic. The background tiles hurt my soul too. If you're going to have a bricked background then you need to remove those daunting, thick black lines cutting through the pattern without mercy. Sorry for the huge delay to my response, I had honestly though I had posted this already. Thanks for the reply, it is appreciated. Don't forget though that was the first build, and this game is in its early stages. Theres quite a long way to go. It does work as drag and drop, not click and click, at least on my end. 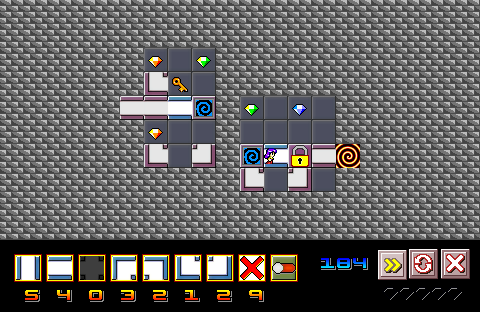 The first 4 puzzles were meant to just test everything works. There are some harder puzzles included in v0.2 and there will be much harder ones in the final build. I will sort the graphics out, they do need work. I already have planned some key levels, and some levels where you need to collect a timer. I like your idea of collecting tiles too, I will definitely include that. These will be coming on the next build, along with the bonus levels. As for the timer, I am thinking either of removing the wait time, or removing the main time limit. and have a timer (without a limit, or maybe a 999 limit) for scoring purposes? What do you think, or should I just leave it as it is? Ah, yes, it is working as a drag and drop in 0.2, not sure what as happening in 0.1 then if you didn't change that function. Graphically I don't want to comment on anything just yet because you've already admitted they're in need of work and I can be rather ruthless regarding them. As for the timer, I didn't really understand why works the way it does. Am I wrong in assuming that Amy spawns on a seperate timer to the main room timer? If so, why not just have the main room timer be replaced with Amy's start timer? The main room timer seems rather defunct to me. And 3 new levels making use of all the above.